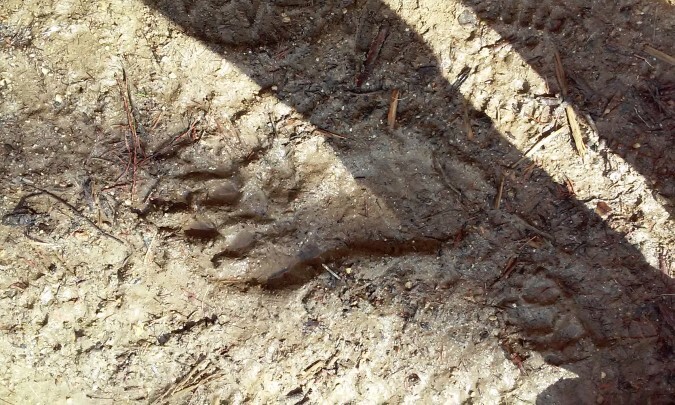 BFRO Report 58251: Wife and husband find tracks, have afternoon sighting near Hellroaring Ridge. Submitted by witness on Saturday, September 23, 2017. OBSERVED: My husband has been working "logging" in the Hellroaring Canyon on Pack river for the last two weeks. One day he texted me saying "this is the first day I don't feel alone up here. My husband and I are avid hunters and enjoy our mountain time. The next day I ended up going to work with him, later on we decide to go for a walk down an old dirt road that isn't accessed with a key to the gate. We came across what appears to be a large foot print my husband wears a size 12 and this print was a few inches bigger. "i have a photo". We never seen or heard anything else that day. On September 22nd we decided to go bear hunting on the other side of the mountain, we also had a key for that gate we drove in 11 miles and to the left of me there's and old clear cut but saplings growing and must be at least 10/15 feet tall I see something black and standing tall and moving through these trees. I yell at my husband to stop and this black figure is gone. I cant find it anywhere.we continue driving no luck at all don't even see a deer we decide to turn around and go back in this same exact spot which is now on my husband's side he slams on the brakes and says what the hell is that give me the gun, I hand the gun and lean over him to see what he's looking at its a tall black figure with a head no ears very wide shoulders and couldn't see the bottom part there was a tree in the way he stares back and takes a step to the left behind a tree all this happened within 40 seconds or so he vanishes again. At this point I have tears in my eyes and scared to death my husband was sick to his stomach almost to the point of being sick we were both so confused on what just happened we started driving and about 400 yards up the road on his side again he seen something move at the corner of his eye he looked quickly and these branches on these trees about 7 feet high were moving right in a row like something very tall had just ran through pushing them out of its way. We are positive 100% positive this wasn't a bear or person we're convinced what we seen last night was, had to of been bigfoot. ALSO NOTICED: We both thought it was odd we didn't see anything out and the wildlife tracks we did see were running it could have been from us or they could have been running from something else that we'll never know. OTHER STORIES: We have two tracks one from this year and one from a year ago in this area. Also there was a logger that said he couldn't wait to leave that area he never felt like he was alone. TIME AND CONDITIONS: I first seen it right around 5:45 my husband seen it, I'm thinking close to 6:20 it got dark at 6:43 and it wasn't quite dark yet things were still visible. ENVIRONMENT: This figure was in an old clear cut with freshly planted saplings about five years back or so they were getting pretty tall.the rest of the area is super thick with timber and old big cedar stumps about a mile away is Caribou lake. I talked to the wife and husband by phone. The tracks and sighting were behind locked gates. These tracks were one quarter to one half mile apart. They were about one mile from the sighting. On September 22, 2017 while bear hunting, the wife saw for just one second, less than 100 yards away, a black upright figure move through the saplings. She estimates the figure was eight feet tall. She did not see arms swing. On the way back, in the same location, the husband saw a black upright figure of similar height and shoulders three or more feet wide. It was seventy five to 100 yards away and he was amazed at the mass of it. It had a rounded head with no ears and no snout. He did not see arms. He said, "there was no brown nose like a bear." He looked at it for fifteen to twenty seconds when it stepped to its left behind a tamarack tree as if trying to hide. Tamarack (western larch) have short needles that turn yellow in the fall and the husband could still see the black figure standing motionless through the yellow boughs. He tried to look through his rifle scope but in those couple seconds of getting the rifle out the window, the figure was gone. Just ten seconds down the road he saw branches moving seven feet high. The side window was down the entire time and he did not detect any odor. The husband grew up in northern Idaho. He has been a long time avid hunter, including bear. As a logger, he is in the forest daily. He was confused at what he saw and was nauseated all the way back to the gate. He also becomes upset recalling the sighting. I find him credible. Kevin has camped, fished and hunted in Eastern Washington all his life. His interest in Sasquatch began when he was 10 years old and saw Roger Patterson present "the" film. He lives and works in Eastern Washington. He has been a veterinarian since 1984, after graduating from Washington State University. He attended Washington BFRO expeditions in 2013, 2014, 2016 and 2017, Oregon in 2015 and 2018, Montana in 2017 and 2018.